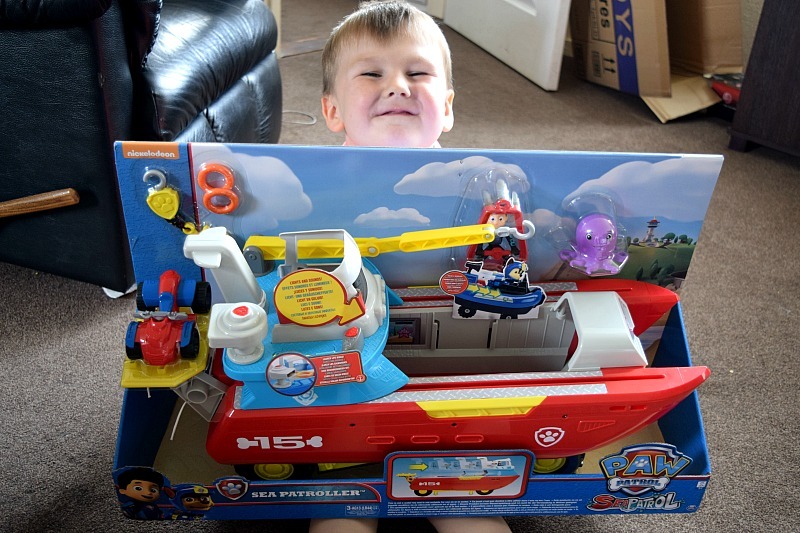 We had a very exciting review item arrive last week; the brand new Paw Patrol Sea Patroller playset. With a house full of Paw Patrol fans I can safely say it went down very well. The Sea Patroller is both a sea and land vehicle, by sliding the bridge over, the wheels drop down making it suitable for any terrain. The sea patroller can hold up to 2 vehicles and comes with Ryder's rescue ATV. Zach was the first to get his hands on the exciting new toy and decided to help me create a Youtube video to show everyone what it does! The set includes sea patroller vehicle, Ryder figure, Ryder's rescue vehicle, baby octopus, two life rings and an anchor. There is a life ring launcher for the kids to shoot out the life rings in whichever direction they like for their rescue missions. The sea patroller also has sound and light effects. The kids all loved the Sea Patroller. It does so many different things and really encourages imaginative play. It is a shame there are no pups included. I think they would have preferred to have one of the pups instead of Ryder as the main character for the set but they have all decided to add some of the characters to their Christmas lists to add to the sea patroller. You can buy the Paw Patrol Sea Patroller from Smyths Toys and other large toy retailers.